Hi! Welcome to Koding Made Simple. Today we'll see how to send html email in php. PHP's mail() function is simple and effective and let you send emails with text/html contents and with attachments. Though it has some shortcomings compared to other mailer libraries like PHPMailer, it does the job and comes in-built with PHP package. Plain text emails are good enough, but the ability to send html emails is more powerful in email marketing and other promotions. HTML emails include html tags and let you add images, format texts and other eye-catching call-to-action buttons etc. But you have to add additional headers for mailing them. You can send mails via third party Mail Servers but you need authentication first. That is if you want to send email via Gmail in php, then you must have a working gmail account and provide the accounts email-id and password for authentication. We'll see how to set up the php configuration for sending email via gmail smtp server. You need to change the settings in two places i.e., php.ini and sendmail.ini files. You must remove the ; at the starting of the line to enable the settings in these files. Please note the configuration is given for the xampp package. Open 'php.ini' file located at C:\xampp\php\php.ini and edit the settings like below. Next open the 'sendmail.ini' file located at C:\xampp\sendmail\sendmail.ini and make the below changes. Save the files and restart apache server for the changes to reflect. 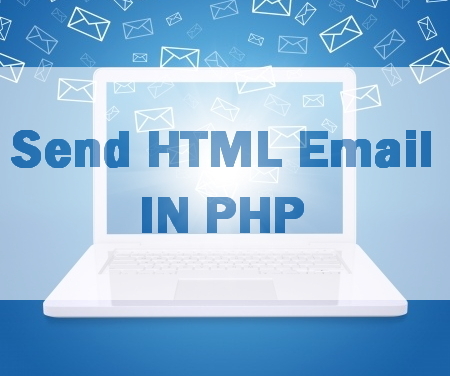 Now you are ready to send send html email using php mail() function. Create a php file and write down the below php mailer code to it and save. Change $from to your gmail-id and $to variable to the recipients email-id. Plus the code includes content type header which is a must for sending html emails and additional headers should be appended with CRLF. Note: If you have enabled two-way authentication for Google account then please disable it for this code to work. That's all about sending html email in php via smtp server. Nice article.. thank you for sharing it. Then you get the smtp settings from your hosting provider and use it. Also make sure sending email is possible with your account. Thanks for your reply. Actually, i have done that, thing is, anytime i use the code below with Html as its body, messages are dropped into spam, but with plain text only, my messages are dropped into inbox.